It’s that time of year again. Winter is here – and along with colder temperatures, snow, and ice, the season also brings unique driving conditions that can impact your Toyota’s performance and longevity, as well as your overall safety. 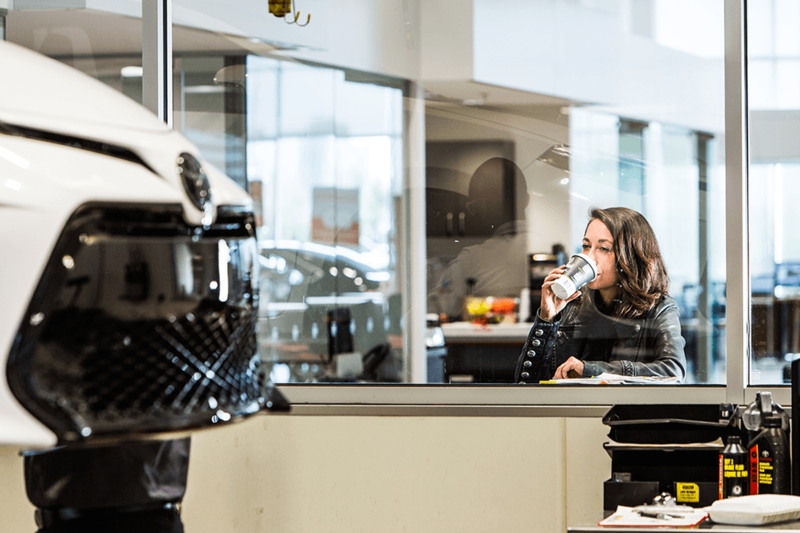 Certain maintenance, like regular brake service, can be done year-round, but other important services are specifically designed to ensure your Toyota is ready to conquer the cold. So take a moment to go through our quick Winter-Ready Checklist and let the winter adventures begin. 1. Swap your summer or all season tires for Toyota authorized winter-rated tires. Bring Your Toyota Home and take advantage of our Price Match Promise* to ensure you’re getting the right winter tire for your Toyota at the right price. 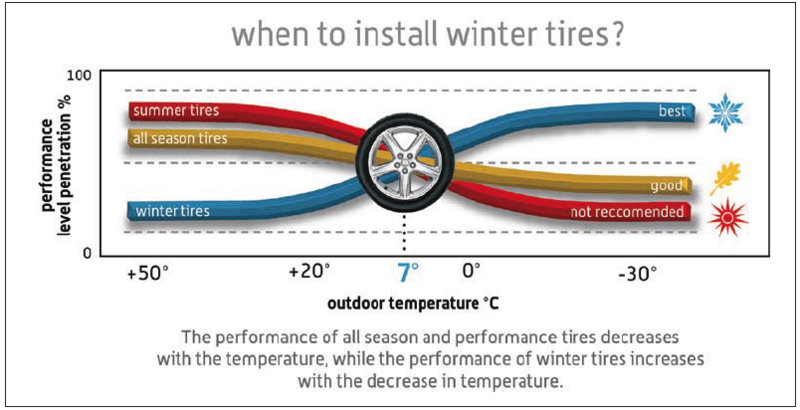 When the weather drops below 7oC, it’s time to switch to winter tires. They significantly outperform summer and all-season tires at lower temperatures because winter tires use a softer rubber compound that helps them grip cold or icy pavement. Plus, their specially-designed treads are better at channelling slush and snow away to improve the traction you have on the road and around corners, as well as your stopping distance when you brake. Tip: Check your tire tread depth by inserting a quarter (caribou’s nose pointing inwards) into your tire tread groove. If you can see the tip of the caribou’s nose (less than 2/32”), it may be time Bring Your Toyota Home to replace the tire. Toyota Genuine Winter Wiper Blades are specifically made for winter, and for your Toyota. While a squeaky wiper is usually a mild inconvenience, a streaky windshield can obstruct your vision and become a major safety hazard, especially when you’re facing the glare of winter sunshine. Winter blades are designed to be heavier and stronger to handle slush, snow and freezing rain, so make sure you switch yours before the first snowfall arrives. Tip: Wiper blades have an average lifespan of 6 months before they begin to wear down. 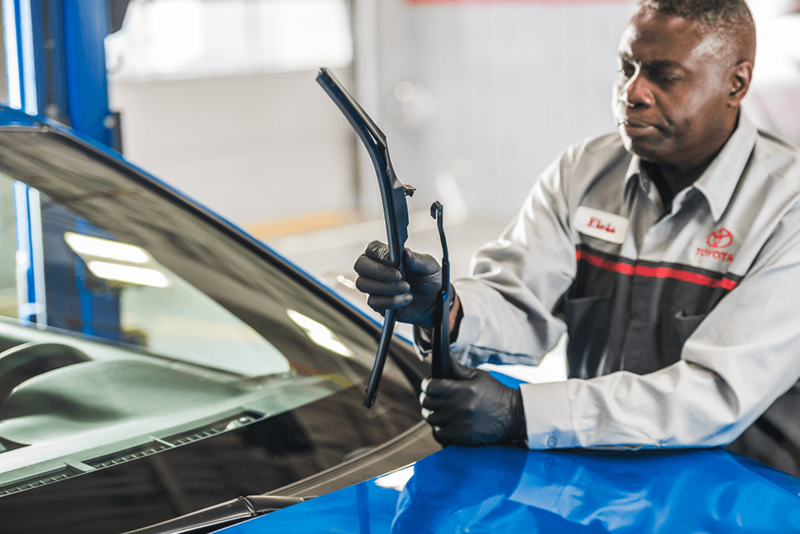 For optimum performance, always have Toyota Genuine Winter Wiper Blades installed by a professional at your Toyota Dealership. Get more value with our larger 4L jugs of Toyota Touch Premium Windshield Washer Fluid, available only at your Toyota Dealer or Service Centre. The right washer fluid is especially important during winter when windshields constantly need to be cleaned in below freezing temperatures. Adding fluid to the reservoir is pretty straightforward – simply pop the hood, locate the tank (consult your user manual if you can’t find it), remove the lid, and pour until the fill line is reached. Or, simply have it done the next time you bring your Toyota home for service. Tip: You never know when your washer fluid will run out - so next time you’re in for service, grab an extra jug of Toyota Touch -40oC rated washer fluid to keep in your trunk just in case. 4. Get a battery health check. Make the most of your visit when you Bring Your Toyota Home and ask for a battery check when you come in for your winter tire change. Dropping temperatures and the increased use of electronic accessories (seat warmers, window defrosters, heat, windshield wipers, etc.) can put a lot of strain on your battery. Plus, the extreme cold pulls voltage from the battery, making it harder for your engine to start. A fully charged automotive battery should measure at 12.6 volts or above and will help you avoid getting stranded out in the cold. 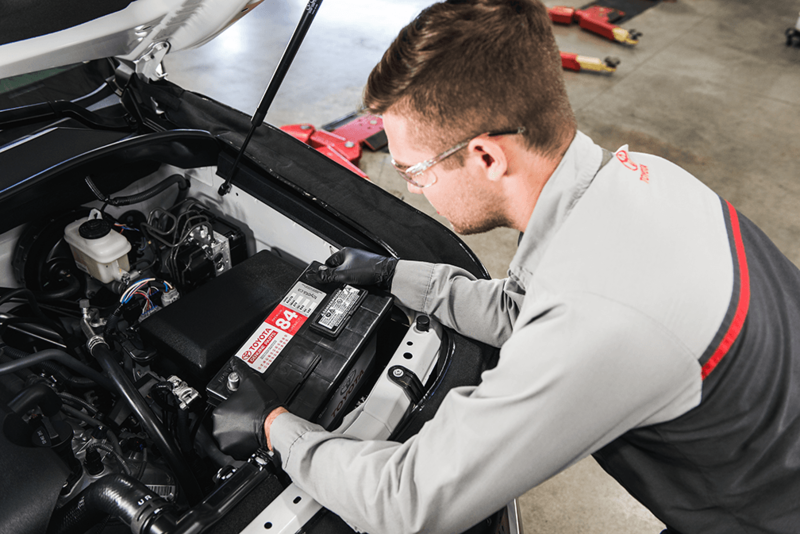 Tip: Even if a battery is new, make sure to have a Toyota technician inspect its cables and connections regularly for signs of corrosion - such as acidic residue around the terminals. When it comes to getting your Toyota winter-ready, there’s no place like home. Winter weather doesn’t mean you have to hibernate. 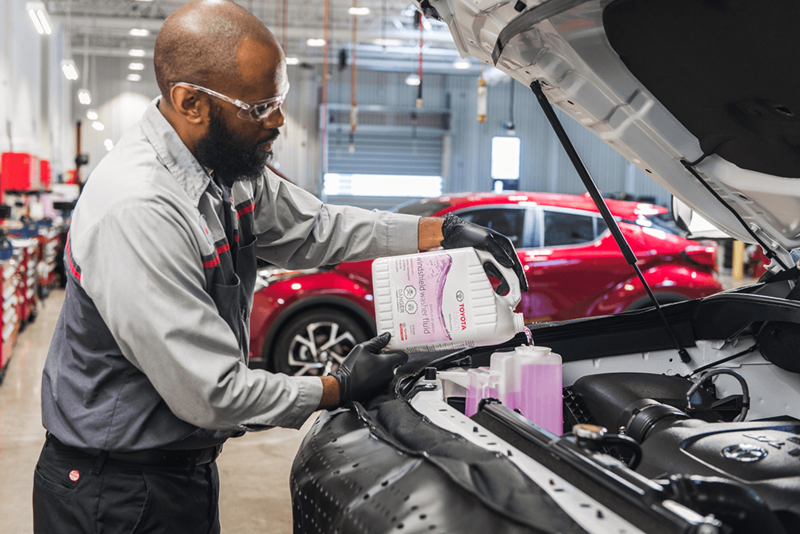 With our expert service, Toyota Genuine Parts, and Price Match Promise on Toyota approved winter tires*, you’ll be fully-equipped and prepped to conquer the snow, sleet, ice, and whatever else Mother Nature throws at you this winter season. All you have to do is book an appointment to Bring Your Toyota Home.